Most experts will say core aeration is the healthiest service a lawn can receive. If you have seen almost any golf course or healthy lawn, you know what the results look like. Bright, green healthy grass, and lots of it, are the result of the process called core aeration. 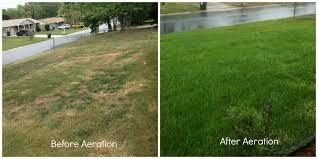 You will also hear it called lawn aeration since the process is performed on your lawn. Over time, the soil under your lawn becomes compacted. As the soil compacts, and thatch grows between your grass and soil layer, the grass roots cannot grow as deep. Strong, deep grass roots produce the healthiest looking lawns. To break it down, simply, core aeration uses a machine that produces holes (cylindrical divots, similar to coring an apple) in your lawn. The ‘holes’ allow the remaining soil to decompress when it rains. In a few weeks, your lawn is able to become stronger and healthier as the grass roots go deeper into the soil. 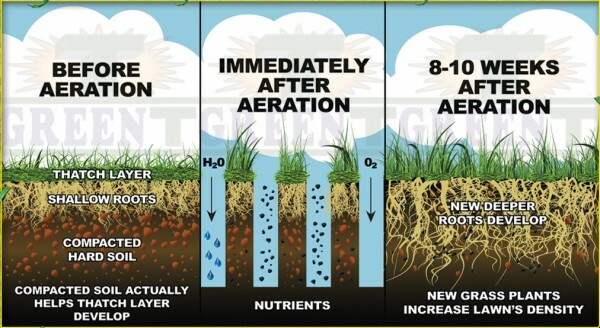 What are the other benefits of lawn aeration? With holes pierced into the surface of the lawn, water and fertilizer can be used more efficiently by the lawn. 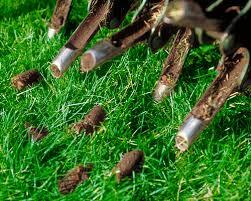 Thatch, the thick buildup under your grass, above your soil, is minimized. Once soil is loosened, lawn aeration means grass roots can grow deeper and stronger. The stronger, healthier grass can withstand more impact. As a result of all the above, your lawn will look … well, more like a golf course. You might be wondering how often lawn aeration should be done. Typically, a golf course will aerate 4 or 5 times a year. However, homeowners should aim for one lawn aeration a year, typically in the fall. Should seeding be done in conjunction with aeration? 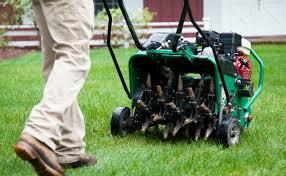 You will often hear the terms lawn aeration and seeding used together. Seeding isn’t like other plants. Lawn seeding is often done after lawn aeration is complete. Remember the soil is filled with all those great little ‘cores’ where the machine punctured the soil. 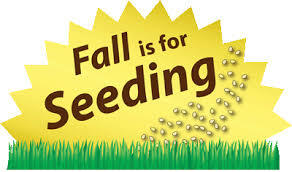 When you seed, you are filling in those premade holes with grass seed. Combining seeding with lawn aeration just makes sense. If you’re ready for a lawn aeration service and/or need seeding contact us today! Request core aeration and seeding service for your lawn.